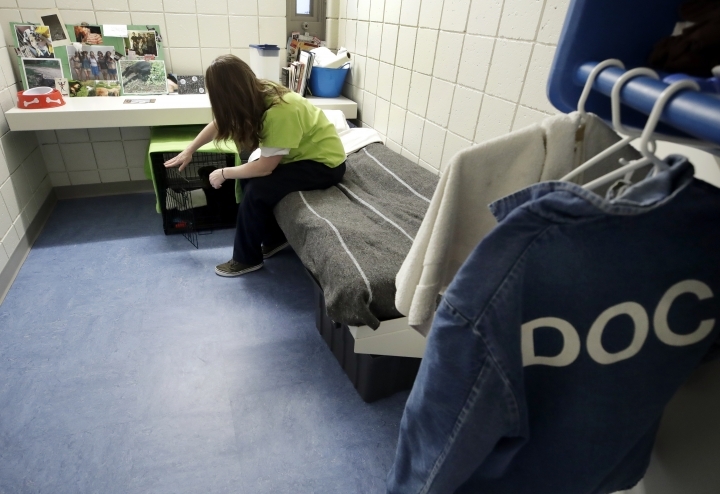 BOSCAWEN, N.H. — Caitlin Hyland's New Hampshire jail cell looks like those of many of her fellow inmates, featuring family photos, a few books and a cot. But one thing sets it apart: the cage on the floor for a 10-week-old puppy. Hyland, a 28-year-old from Concord, New Hampshire, who is serving time for a drug conviction, is one of four inmates at the Merrimack County jail who are training puppies. 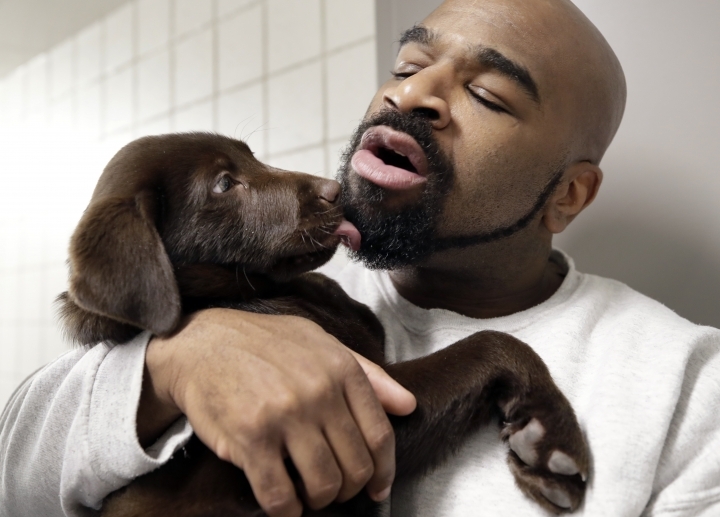 In a partnership between a group called Hero Pups and the jail, two male and two female inmates, who are all in the jail's drug treatment program, will raise the puppies for the next two months. They will eventually be handed over to military veterans and first responders who are struggling with post-traumatic stress disorder and other challenges. "It feels like a second chance," Hyland said of being chosen to raise the chocolate Labrador retriever mix puppy. She must feed the dog three times a day, walk it every two hours for 20 minutes and is giving it obedience training. The dog stays with her around the clock. "It's just amazing to have that unconditional love," she continued. "I am learning so much about finding the balance. You have to love yourself before you can appreciate the love something else is giving you." Justin Martin, another inmate, says his dog has given him a sense of purpose. "Knowing he is going on to help someone else is totally huge for me," said Martin, 33, of Barnstead, New Hampshire. "With me and my sobriety and recovery, it's just really a life-changer. He is really changing two lives." The program is the first of its kind in New Hampshire but mirrors similar programs around the country in which inmates raise and care for animals, typically dogs. NEADS World Class Service Dogs works with inmates at seven facilities in Massachusetts and Rhode Island to train service dogs, while Leader Dogs For the Blind works with prisons in Minnesota, Iowa and Michigan in raising puppies that eventually become guide dogs for people who are blind. At one program at the Erie County Correctional Facility in New York, inmates raise pheasant chicks that are then released into the wild. Supporters of the programs say the puppies get a dedicated trainer while the inmates learn to be more caring, compassionate and enterprising — skills that can help them once they are released. 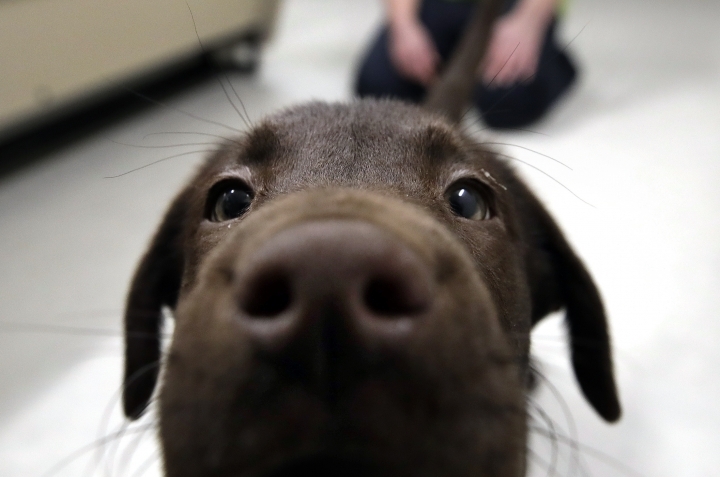 Several studies suggest that puppy programs in prisons and jails have reduced anxiety and depression among inmates and increased morale among staff. Some groups say the programs have lowered recidivism rates, though it's unclear what role the puppies played. 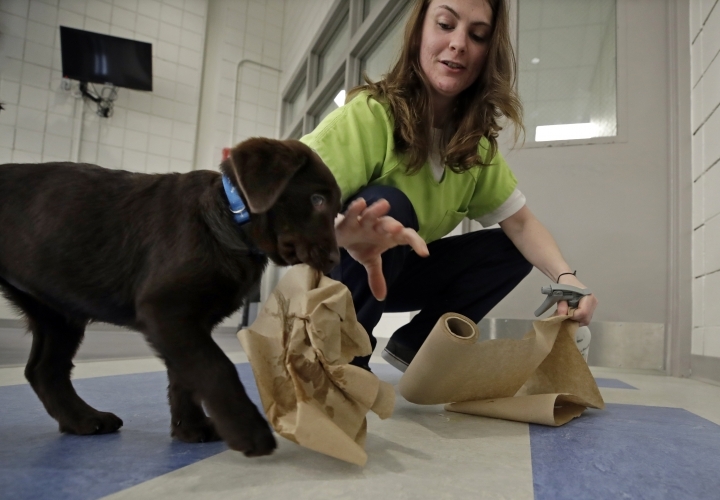 In New Hampshire, Merrimack County Department of Corrections Superintendent Ross Cunningham said he hopes the puppy program will help inmates undergoing drug treatment to stay clean. "It's teaching them some responsibility. 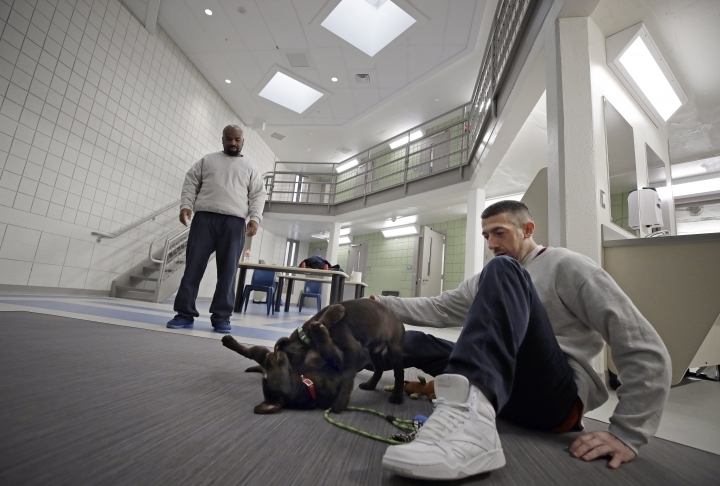 It's teaching them some structure," he said, adding that he appreciates how a dog trained in a jail returns to the community and becomes part of a family. Laura Barker, the board president at Hero Pups, said she had long wanted to work with prisoners, who typically have "dramatically higher rate of success" in training the dogs. Unlike volunteers outside of prison who must juggle other commitments, inmates can more intensely focus on the animals they are training, and they spend the bulk of their time with the dogs, she said. "These dogs go on to help people," said Barker, whose group has trained 40 dogs since 2016. "Being able to contribute something positive to the inmate participants just adds another layer of awesomeness." The arrival of the puppies at the jail's minimum security unit last week has reverberated well beyond the four inmates that care for them. On any given day, all 30 inmates in the unit have an opportunity to interact with the dogs and rubber toys can be found in the television room and other common areas. The animals prancing about, snoozing or yelping offer a sense of normalcy in a facility that often feels cold and tense, inmates said. "It has had a positive impact. When I look on security cameras, I see puppies running around," said Assistant Merrimack County Department of Corrections Superintendent Kara Wyman. "That lifts the staff." This story has been corrected to show the puppies are 10 weeks old, not 4 weeks old.